1.01 The Flyscreen Company Ltd is hereafter referred to as the “Seller” and all customers are hereafter referred to as the “Buyer”. 1.02 Each quotation or order recorded overleaf contains (together with these terms) all of the terms of the contract and overrides and excludes any other terms stipulated or incorporated or referred to by the Buyer whether in the order or in any negotiations and by any course of dealings established by the Seller and the Buyer. All orders hereafter made by the Buyer shall be deemed to be made subject to these terms. 1.03 No modifications of these terms shall be effective unless made by an express written agreement between the parties. The signing by the Seller of any of the Buyer's documentation shall not imply any modifications of these terms. 2.02 The goods have been paid for in full or, where agreed by the Seller, deposits have been received (unless the Buyer has been granted approved account facilities by the Seller and the terms of the facility have not been exceeded). Due to the custom made nature of our products the Buyer will be liable for 100% of the value of confirmed orders. The Buyer may not cancel supply contracts without the consent of the Seller, which if given shall be deemed to be on the express condition that the Buyer shall indemnify the Seller against all loss, damage, claims or actions arising out of such cancellation unless otherwise agreed in writing. 4.01 Payment terms: strictly as shown on the invoice. Any delays in payment on account will result in the withdrawal of account facilities and suspension of orders in progress. 4.02 Interest at 5% over bank base rate (minimum 8%) is chargeable on overdue accounts. 5.01 Risk of loss or of damage to the goods shall pass to the Buyer at the time of delivery. 5.02 The Seller shall not be liable for claims of any kind from the Buyer arising from any damage to the goods occurring after the risk has been passed howsoever caused nor shall any liability of the Buyer to the Seller be diminished or extinguished by reason of such loss. 6.01 The property in the goods shall not pass to the Buyer until all sums due or owing to the Seller by the Buyer in respect of all goods and services ordered by the Buyer from the Seller have been paid for in full and until payment the following provisions of this Clause 6 shall apply. 6.02 The whole of the price shall not be treated as paid until any cheque, bill of exchange or other instrument of payment given by the buyer has been met on presentation or otherwise honoured in accordance with its terms. The Seller may sue for the whole of the price at any time after it has become payable. 6.03 If the Buyer defaults in the punctual payment of any sums owing to the Seller the Seller shall be entitled to the immediate return of all goods sold by the Seller to the Buyer in which the property has not passed to the Buyer, and the Buyer hereby irrevocably authorises the Seller to recover the goods and to enter any premises of the Buyer for that purpose. Demand for or the recovery of the goods by the Seller shall not of itself discharge either the Buyer's liability to pay the whole of the price or to take delivery of the goods or of the Seller's right to sue for the whole of the price. a) To cancel any undelivered or uncompleted portion of the Contract and stop any goods in transit. c) To repossess the goods or any of them without prior notice. a) work is carried out in normal working hours Monday to Friday excluding public holidays, unless otherwise stated. 7.02 Any additional costs incurred as a result of non-compliance with 7.01 will be charged to the Buyer. 7.03 The Seller shall not in any circumstances whatsoever be liable to the Buyer for any loss or damage involving any person, property or interest howsoever suffered by the Buyer in connection with the installation, use, functioning or state of goods, or in connection with anything done or omitted to be done by the Seller, its servants or agents. 8.01 All prices, unless stated, exclude carriage/delivery. 8.02 The Buyer must inspect the goods immediately on delivery and give notice to the Seller's office within 48 hours of delivery and confirmed in writing within seven days of delivery of any matter or thing whatsoever by reason of which the Buyer considers that the goods as delivered are not in accordance with the contract (including shortages). Any such notice must be given before the goods have been re-sold, cut, treated, altered or made up in any way whatsoever. If no such notice is given the goods will be deemed to be in all respects in accordance with the contract and the Buyer will be deemed to have accepted the goods and be bound to pay for them. This clause does not apply to defects which the Buyer could not reasonably have discovered by careful examination of the goods. Goods can only be returned to the Seller with the prior agreement in writing of the Seller. A handling charge may be imposed by the Seller in respect of returned goods. 8.03 The Seller shall not in any circumstances whatsoever be liable for any loss or damage caused as a result of late delivery of goods. 9.01 It is the responsibility of the Buyer to ensure that the product is appropriate for the purpose and application in which it will be used. The Buyer shall be responsible, at the Buyer's expense, for ensuring that adequate tests are carried out. 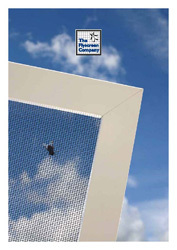 10.01 The minimum age for purchasing from The Flyscreen Company is 16 years of age. (b) contact information including email address. (d) other information relevant to customer surveys and/or offers. 11.02 What we do with the information we gather. (b) we may use the information to improve our products and services. (c) we may periodically send promotional emails about new products, special offers or other information which we think you may find interesting using the email address which you have provided. (d) from time to time, we may also use your information to contact you for market research purposes. We may contact you by email, phone, fax or mail. We may use the information to customise the website according to your interests. All data collected is processed according to law and is not and will not be sold onto any third parties.